Not sure if ‘Dad Date’ really works, are you? But if you can have ‘Mate Dates’ then why not? After all, this is the bloke who taught me to ride my bike, catch a ball, and that films really aren’t scary if you turn the sound right down. The least he deserves is the occasional pint and a bite to eat, right? 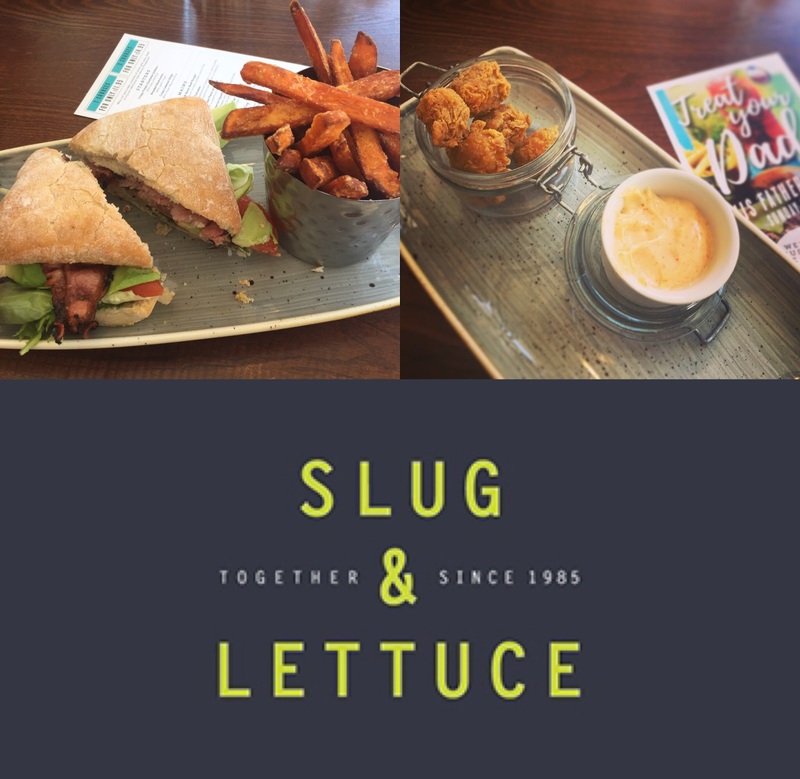 So as part of our little family history jaunt round Liverpool, we headed for a spot of lunch at the Slug & Lettuce on busy North John St before an afternoon of trawling through records in the library, recreating our own version of the BBC’s ‘Who Do You Think You Are’. 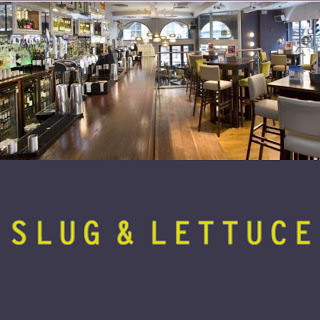 I must have walked past the Slug & Lettuce I don’t know how many times and never been in before; I’m not much of a drinker and just never had it pegged as a lunch spot – perhaps because it’s in a fairly nondescript building in a city surrounded by much more beautiful architecture – but we were in for a nice surprise. It’s really spacious and even though it was a bustly lunchtime we had no problems finding a nice table by the window for some serious people watching. I don’t normally have more than one course at lunchtime unless I know for certain I’m going straight home for a mega nap, but I liked the look of the Salt & Pepper Shrimp Bombs which come in a cute little kilner jar with some seasoned mayo so started with them. Dad didn’t fancy a starter as he wanted a ‘proper dinner’ and chose the Cumberland Sausage & Mash which he described as ‘lovely’ and I think was made all the lovelier by the fact that my mum never makes it at home. They had the usual pub grub fare on the menu which oldies like my dad always love – Scampi & Chips, Cottage Pie, etc – and what I thought were some pretty good veggie options too like Butternut Squash Lasagne (with spinach, goats cheese and pea shoots), Grilled Halloumi Tortilla Salad with avocado and edamame beans, and (if you count fish as vegetarian option) Fishcake & Superfood Salad. So it’s a pretty safe option if you’re taking your dad, grandad, or the Golden Girls in your life out for something to eat but still want some decent meat-free choices for yourself or teenagers. I am a sucker for small plates and could have teamed my shrimp starter with jalapeños or steamed buns but went for Bacon & Avocado Ciabatta instead. It was just the job but I didn’t manage to finish the sweet potato fries that came with it, so called it quits before dessert while my dad managed the Lemon & Lime Tart Wedges with a brew. They’ve got a load of little puddings that you can mix and match for £7 and I was really tempted but knew I’d never get off my arse if I didn’t stop eating, and we had places to go and things to see that afternoon. The fact you can add a slice of cake to your tea or coffee for just a quid, or have a Baileys Iced Latte (which is basically my idea of heaven), took every ounce of my willpower to resist but we had to get to the Western Approaches museum before it closed and had big plans to take some silly selfies with the Cilla Black statue on the way. The team were fab (I think my dad wanted me to leave him there with Jackie the lovely manager instead of having to hang out with me all day) and the service was quick and friendly. The loos (which were v clean, I’ll have you know) were down a flight of stairs and couldn’t see any sign of baby changing facilities but the pub was child friendly and there’s babycinnos for 50p and a really appealing and healthy kids menu so even though we didn’t have my 3 year old with me, it’s handy to know they cater for kids and I’d happily take him in there for something to eat without breaking the bank next time we’re in town. As well as half term families, the place was full of couples of all ages from teenagers to bus passers like my dad, ladies who lunch with fabulous hairdos and handbags, grandparents with small children, work mates in suits, and some overseas students taking a break from their walking tour of Liverpool. Maybe there were some other daughters taking their ‘Arl Fella’ on a Dad Date, I’m not sure, but we should make that a thing! If you’re staying nearby at the Hard Days Night Hotel, Aloft, or Z hotel, then it’s a good alternative to the pricier restaurants on Castle Street and if you’re visiting the famous Cavern on Mathew Street or shopping in Liverpool One then it’s a good place to have an unhurried lunch and a drink without paying over the odds. The fact that they also do breakfast and brunch is handy for early checkouts from hotels and serviced apartments. I noticed on the menu they’ve got loads of offers on like 50% off food, 2-for-1 cocktails, deals on Tanqueray and Prosecco (we all know I hate gin but I have to respect a bargain when I see one) plus mini cocktail sharing boards for the after work and weekend crowd and cocktail master classes for girls’ nights out (or 70 year old dads’ nights out – let’s not be sexist or ageist here). So if you’re taking your Dad out for a bite to eat – and especially if he’s a true Scouser who’ll never let his daughter pay – then you know where to head for a Dad Date that won’t eat into your inheritance too much!